Well bred filly Downloads can open a window of opportunity to earn a spot in the Group 1 $1.5m Ladbrokes Blue Diamond Stakes (1200m) at Caulfield in a fortnight if she can perform up to the stable’s expectation in the Fillies Prelude today. Jockey Kerrin McEvoy, above, rides Downloads in the Ladbrokes Blue Diamond Prelude for the fillies at Caulfield. Photo by Ultimate Racing Photos. 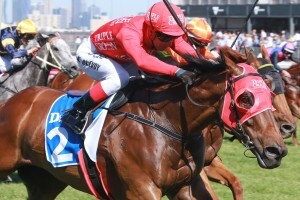 Downloads will step out as a firming $7 chance with Ladbrokes.com.au in the Group 2 $200,000 Ladbrokes Blue Diamond Prelude (1100m) for the fillies at Caulfield today and Lindsay Park co-trainer Ben Hayes is anticipating plenty of improvement on the filly’s debut run. The Fastnet Rock filly settled at the tail of the field before making up plenty of ground in the straight when three quarters of a length fourth to Lady Horseowner in the Group 3 $150,000 Ladbrokes Blue Diamond Preview (1000m) for the fillies at Caulfield on January 27. “I was really impressed with her run,” Ben Hayes told racing.com. “She made a big sweeping run from the 700m and her run probably just ended the last bit. Kerrin McEvoy has stuck with Downloads who will jump from barrier six in the eleven horse Ladbrokes Blue Diamond Prelude field. The Lindsay Park Team of David and Ben Hayes and Tom Dabernig will also saddle up debut winners Enbihaar and Angel. Enbihaar (barrier 4, Stephen Baster) comes to Caulfield after winning a 1000m two year old at Morphettville Parks in Adelaide on January 20 and is steady at $14 while Angel (barrier 3, Mark Zahra) is a drifting $17 chance on the strength of her maiden win at Geelong over 1118m on January 4. The Tony McEvoy trained Oohood dominates the betting at $2.90 and will jump from gate five with Luke Currie in the saddle again. Currie has ridden the I Am Invincible filly at her only two starts for a second to Long Leaf in the Listed $120,000 Merson Cooper Stakes (1000m) at Sandown at the end of the 2017 Melbourne Spring Carnival and a third behind Lady Horseowner and Crossing The Abbey in the Group 3 $150,000 Ladbrokes Blue Diamond Preview (Fillies) (1000m).